After spending two years at a community college in Barstow, California, Roberto Dyea ’19 transferred to the University of Redlands to pursue a major in studio art. 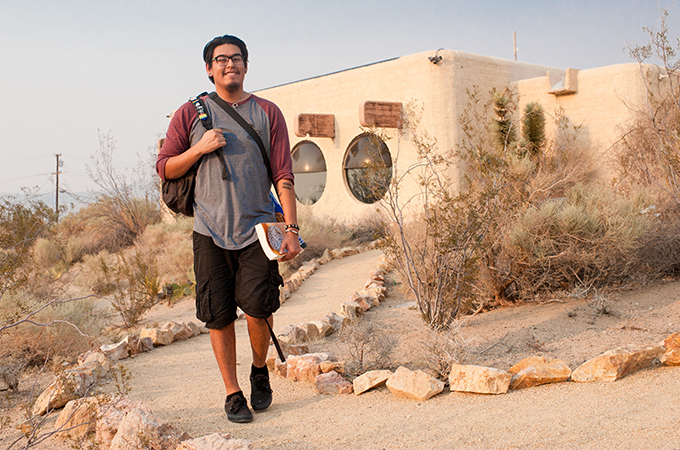 What he didn’t expect to find was a home away from home in Native Student Programs. Dyea, member of the Pueblo of Laguna tribe, found a different landscape at the University of Redlands and prioritized getting involved. After joining the Native American Student Union (NASU), he became an intern in the office of Native Student Programs (NSP), which is supported by the San Manuel Band of Mission Indians. At NSP, he assists with office and volunteer work and travels with staff to regional high schools to talk about the program’s offerings. Being a studio art major has also taught Dyea a thing or two. Since arriving at Redlands, Dyea has widened his artistic skillset and worked with new media such as acrylic and oil painting, sculpture, ceramics, photography, and different computer programs with the help of Professor Munro Galloway. Dyea has benefitted from the studio art program in other ways as well. During a trip to San Francisco, he and his classmates toured a design agency and met designers at Facebook’s headquarters. Program faculty also encouraged him to apply for internships, one of which turned into an opportunity to work at the New Americans Museum in San Diego, California, last summer. Learn more about Studio Art and Native Student Programs at the University of Redlands.